Do you love having one of a kind pieces in your home? Or giving that perfect personalized gift? Either way, these wood burned wooden spoons will fit the bill and they are so fun to make!! The cut file for this project is completely ready to go! Simply click here and you will be taken to Cricut Design Space. 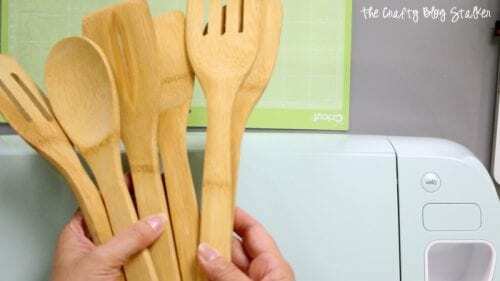 I have the file sized to fit most wooden spoons. If this size works for you then you can click on Make It. If you need to adjust the sizing, click on customize. My wood spoons came in a set of 6 so I made 6 word stencils. If your set has more or less feel free to pick and choose which words you want or duplicate some of the words. Place the vinyl onto the light-grip mat. Follow the prompts in Cricut Design Space to cut the image out. I cut this out on a Cricut Explore Air 2 but all Cricut machines cut traditional vinyl so it will work with any Cricut Cutting Machine. Once the image is cut, weed the excess iron-on vinyl from the backing sheet. The BrightPad is super helpful during this step because it shines light through the lines so you can easily see the areas you need to weed. This time, we are creating a stencil so we remove the letters in side the rectangle. Make sure to leave the center of the letters too! 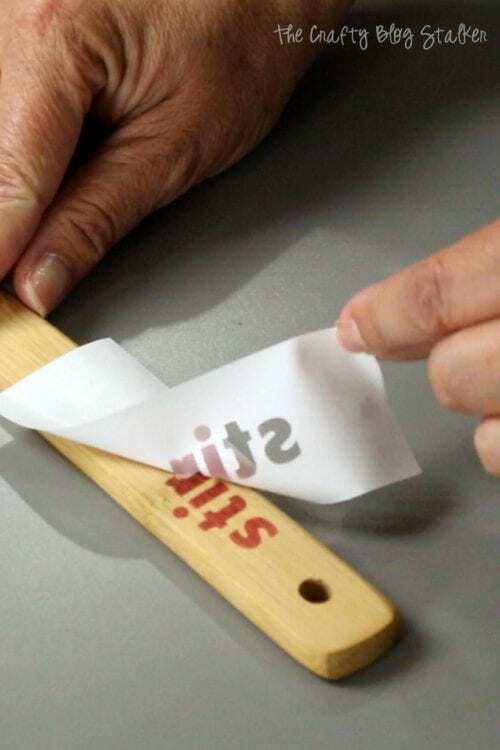 Apply the vinyl stencil to the handle of the wood spoon. Once you are happy with its location, press into place. 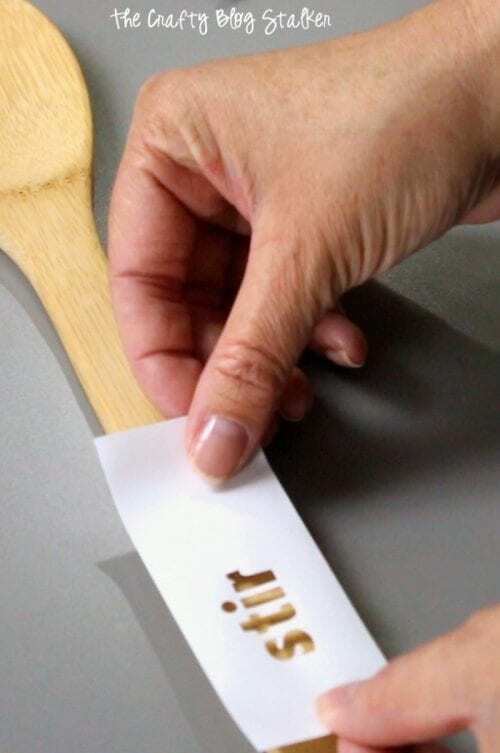 Using an ink pad and a sponge, apply ink to the stencil by rubbing the sponge in ink and then rubbing over the stencil on spoon handle. 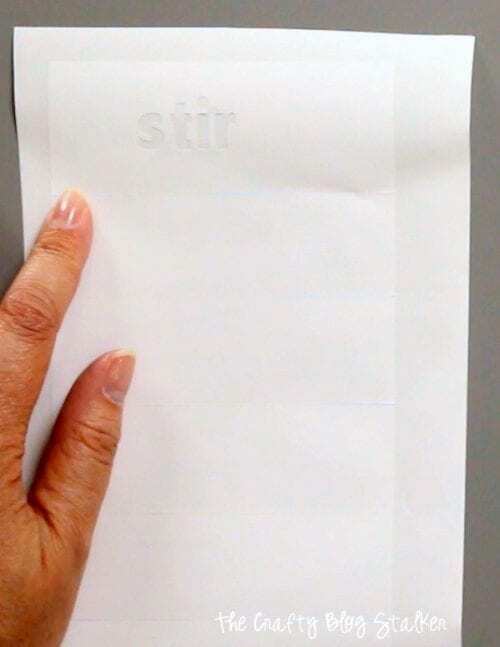 When the vinyl stencil is removed you will see exactly where you need to burn the handle. You can use a pencil and outline the stencil as well. Although I think the ink is much faster. The next step is to wood burn. Before we begin there are a couple of safety items to keep in mind. The wood burning tool gets VERY HOT. Watch the cord and make sure there are no little ones are at your feet where they could get burned if the tool is dropped. This will also mar a countertop if the tip of the tool is laid against it. I suggest using a silicone mat. It will protect your surface and won’t melt. 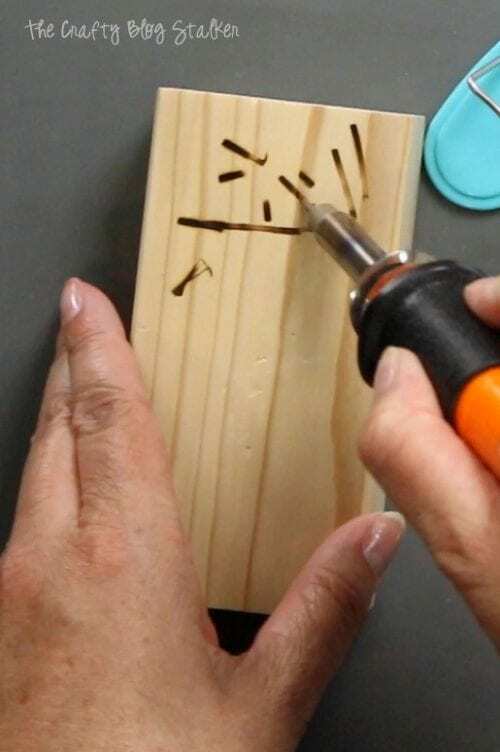 Also, before you begin on your project, play a little with a scrap piece of wood. Make sure the tool feels comfortable in your hand and you know the pressure needed to create the look you want in your spoons. 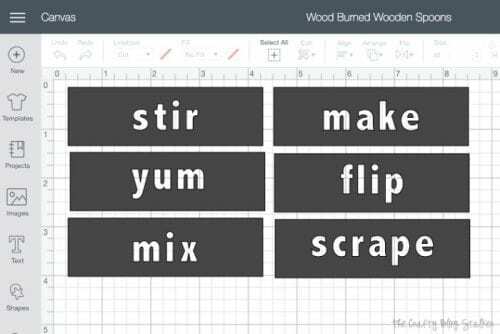 Using the wood burning tool, carefully go over the inked letters. 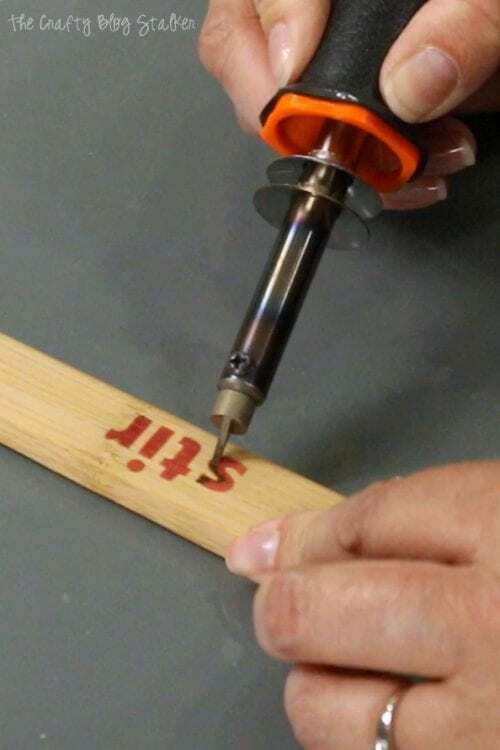 Different wood burns differently so you may need to go over each letter several times to get a nice dark burned look. When all of the spoons are finished you have a fun set of personalized spoons that you can give as a gift or keep for yourself!! 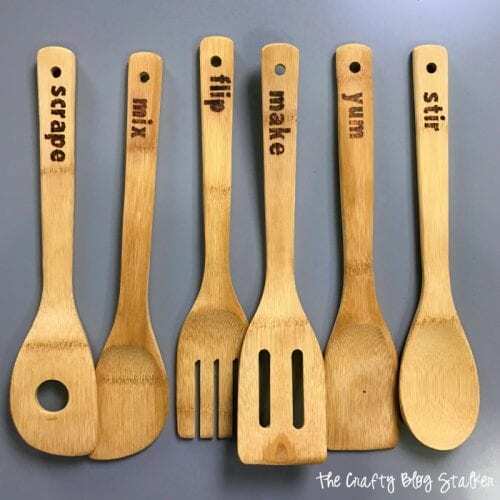 What will you do with your fun wood burned wood spoons? Share and leave a comment below! You can watch the full Facebook Live tutorial here! 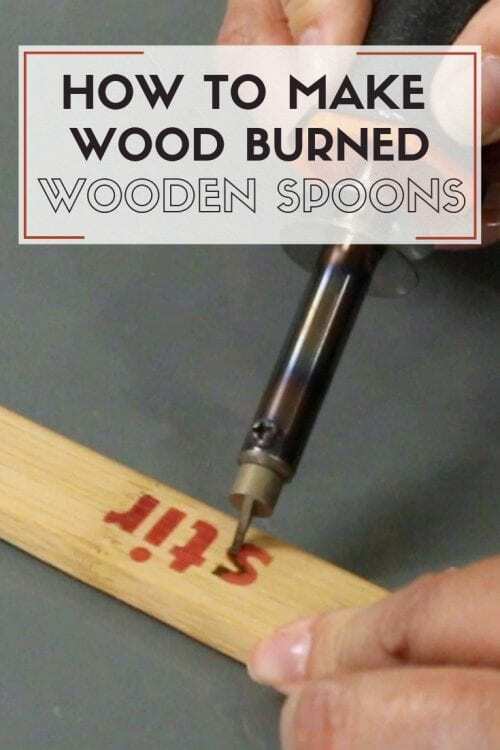 SAVE HOW TO MAKE WOOD BURNED WOODEN SPOONS TO YOUR FAVORITE DIY PINTEREST BOARD! Love this. Great Idea and so personal. Thank you Tracy!! They were so fun to make!